73 years ago today, a key event of World War 2 took place. The Western Allies landed troops on the beaches of Normandy in northern France, beginning a counter-offensive to liberate occupied Europe. Let's take a look at the story behind this operation. In February 1943, the bitter loss of the Wehrmacht's 6th Army in Stalingrad signaled a turning point in World War II. From the opening of the Battle of Stalingrad, Stalin had demanded that the Western Allies land in Western Europe to open a second front in the war. The United States landed troops in Morocco on 8 November 1942 to bring an end to the campaign in North Africa alongside the Commonwealth forces. In July the following year, a joint US-UK operation was conducted. Troops were landed in Sicily and then the Italian Peninsula. After fierce fighting, Italy was defeated, leaving Germany without nearby allies to call upon. However, the Allies believed that a landing on the Northwestern Europe was the best way to defeat Germany, which led to the forumlation of Operation Overlord. This operation was placed in the hands of General Dwight D. Eisenhower, the Supreme Commander of the Allied forces. Planning was done collaboratively with Field Marshall Montgomery, Air Chief Marshall Leigh Mallory, and Admiral Bertram Ramsay of the United Kingdom. The overall plan was developed by General Walter Bedell Smith. 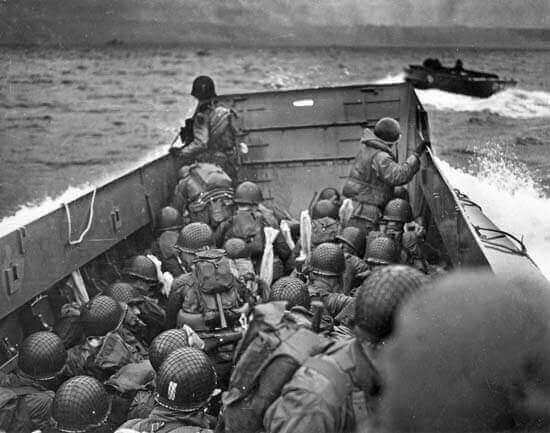 Operation Overlord's primary objective was to directly land troops on a segment of the French coastline at Normandy. Three divisions of the United States 1st Army and three divisions of the United Kingdom's 2nd Army would land with the support of three airborne infantry divisions. Prior to the beach landings, the Allied forces utilised their air superiority to conduct prolonged, systematic bombing of strategic locations, major roads and railways. Several feint attacks were also conducted to keep the Germans busy. "Heeresgruppe B" of the German Army, under the command of General Feldmarschall Erwin Rommel, was on standby in Northern France to respond to an Allied coastal landing. Rommel recognised the air superiority of Allied force and believed that the landing site would be the only chance to stop the invasion. He wasted no time preparing an impressive line of defences consisting of coastal fortifications, which would eventually come to be called "The Atlantic Wall" (German: Der Atlantik Wall). It comprised turrets made of steel and concrete, expansive minefields, barbed wire, and underwater mines. Rommel placed the armoured divisions on standby near the coastline to prepare for immediate counterattack against an Allied landing. According to Rommel, with these fortifications, the outcome of the battle would be determined within 48 hours of the commencement of the landings. With regard to the landing site, Hitler and his army staff considered Calais, the point at which the English Channel was narrowest, to be the most likely landing site. They would later learn that they were wrong. It was for exactly this reason that the Allies chose to attack elsewhere... while using a "Ghost Army" to convince the Germans that the attack would come from Calais. The Allies underwent a long period of preparation and rehearsal, and initially defined the D-Day of the operation as 5 June 1944. In the early morning, Eisenhower received a less-than-promising forecast: low cloud, strong wind and high waves. He decided to postpone the landing by a day to see if the weather improved. On the next day, the weather did not improve. The German Army made a similar forecast, so they considered a landing operation on 6 June to be very unlikely seeing as the Allies had taken no action on 4 and 5 June. Rommel decided to ask for leave to visit his home. Later, the metrological unit brought encouraging news: a 36-hour window of improved weather would be available between two weather fronts. The weather would then periodically worsen, and after that only the powers that be knew when a good time would be for a massive amphibious landing. Eisenhower pondered for a while and eventually gave the final order to initiate landing operations on 6 June. More than 6000 ships and landing vessels left the ports of the southern United Kingdom, and C-47 transport planes and gliders carried three whole Allied airborne divisions from their airfields. 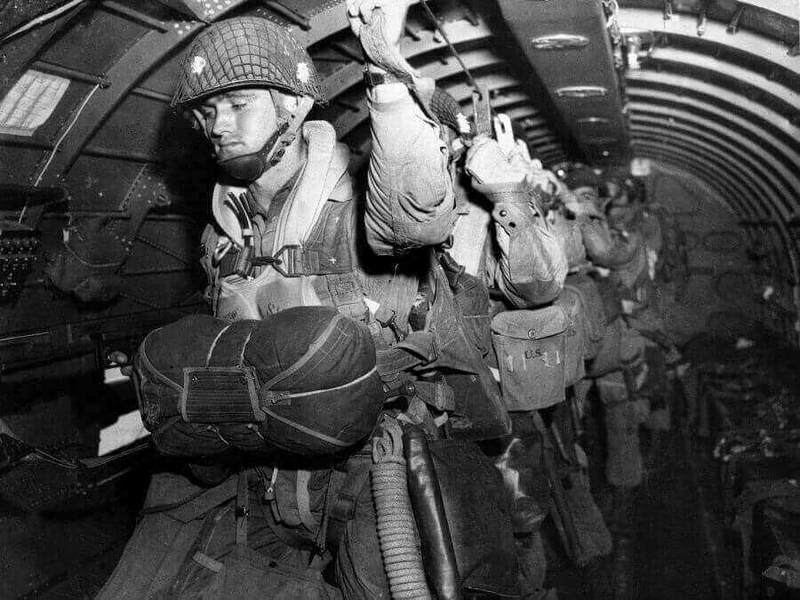 Of all the units to fight in Normandy, the airborne were the first to make contact with the Germans. The first to land were the commandos of the British Army's 6th Airborne Division. Their mission was to capture Pegasus Bridge and the bridge on Orne River to cut off the passage that the German counterattack units would use. By the combined efforts of the 5th Airborne Brigade and 7th Battalion, these targets were captured intact. To the west, the famed 101st and 82nd Airborne Divisions landed on an area 40km long and 25km wide: the entrance of the Cotentin Peninsula. The mission of the paratroopers was to cut off the peninsula from other German units and support the 4th Infantry Division on Utah Beach to facilitate a later assault on Cherbourg. Because of intense German anti-aircraft fire and the difficulty of making an organised airdrop in the middle of the night, American paratroopers were scattered across a very large area, often separated from their comrades and parent units. This made it difficult to form a cohesive fighting force with which to carry out their missions. Some even dropped into flooded marshland and drowned. However, in spite of the chaos, the paratroopers remained focused on their task. Banding together for a common purpose, their actions behind German lines confused the German Army, preventing them from initiating focused counterattacks. The 82nd Airborne Division suffered heavy losses during the drop at Sainte-Mère-Église, yet they captured the town by dawn. It became the first French town freed by the Allies on D-Day. At the crack of dawn, Allied air forces commenced intense bombing of the beaches of Normandy, and the warships bombed the targets on the shore. The air and naval bombing suppressed the German artillery in the fortifications, dealing heavy damage to their fortifications and, more importantly, their communications network. The first wave of the landing force approached the shore under the cover of intense bombing. The action was impeded by the violent northwestward wind, which generating high waves that slowed the advance. Many landing vessels were brought away from the expected site, mixing up the troops belonging to different command structures. The beach of the normandy coast was divided into five sectors for this operation: Utah, Omaha, Gold, Juno, and Sword. Theoretically, each landing area was 10,000 yards wide, and each was assigned to a different unit. Each vessel and their infantry were to approach the beach and land 75 yards apart from each other. Every soldier participating in the mission received training regarding rapidly embarking and disembarking the landing vessel, finding the way fowarrd on a beachhead with barriers, and covering the engineers as they set up detonators. The first wave had one specific mission: they had to establish a beachhead and pave the way for their reinforcements. At Omaha Beach, the American force suffered the heaviest casualties from the encounter of German resistance that was stronger than expected. The 1st and 29th United States Infantry Divisions encountered the entirety of the 352nd German Infantry Division instead of the single regiment they had expected. The 32 Duplex Drive (DD) tanks of 742nd Armored Battalion, which were expected to land and support the landing force, were unloaded 5000 yards from the shore, and 27 were sunk due to poor conditions at sea. The landings at Omaha Beach were done almost entirely without armour support, leaving the troops exposed on the featureless beach... resulting in catastrophic numbers of casualties. The high cliffs of Omaha Beach also impeded their advance. The infantry that had landed were pinned down on the beach and their command structure was broken. Naval bombardment allowed the following waves to land, and the Germans eventually exhausted their munitions and abandoned their positions when the bunkers overlooking the beach were destroyed. The American units opened the way inland in the afternoon, and the battle was decided. The landing had succeeded, but at great cost: at Omaha Beach, the Allies suffered 2,500 casualties in a single day. The landings at Utah Beach were carried out by the United States' 4th Infantry Division. The 8th Infantry Regiment landed with 28 DD tanks. However, they soon found that the sea flow had brought them southwest, 1.8km from the intended landing site. The 4th Infantry Division encountered little resistance. By the end of D-Day, 21,000 men had landed with only 197 casualties. The assault on Pointe du Hoc was done by 225 commandos of the 2nd Battalion. They used throwing hooks, ropes, and long ladders to ascend the 30-metre-high cliff to attack the German guns positioned there overlooking Utah Beach to the west and Omaha Beach to the east. They encountered approximately 200 German soldiers of the 914th Regiment of the 352nd Division, but found the Germans have already relocated the artillery when they reached the top of the cliff. Landing at Gold Beach was the British 50th Infantry Division. The landing process was difficult because of weather conditions that forced the British to forgo the amphibious usage of DD tanks. Instead, they were directly delivered to the shore. Shore bombardments had neutralised the firepower of the Germans, making the advance easier for all but the 47th Royal Navy Commando Squad on the way to Port-en-Bessin. The British force did not make it to Bayeux, but established contact with the Canadian forces who were responsible for Juno Beach to the east. The result was promising. The British army took about 1,000 casualties on Gold Beach. Because of poor conditions at sea, the landing on Juno Beach did not begin on schedule. Canadian infantry also encountered several problems after landing, namely that the soldiers landed before their supporting tanks and were exposed to German gunfire. The advance inland was also affected by traffic jams on the beach and in nearby towns and roads. The Canadians encountered organised resistance as they pushed inland and the fight continued until nightfall. Fortunately, the connection between Sword Beach and Gold Beach was established, providing them with a beachhead 19km wide and 10km deep. Canadian casualties on Juno Beach on D-Day numbered 961. 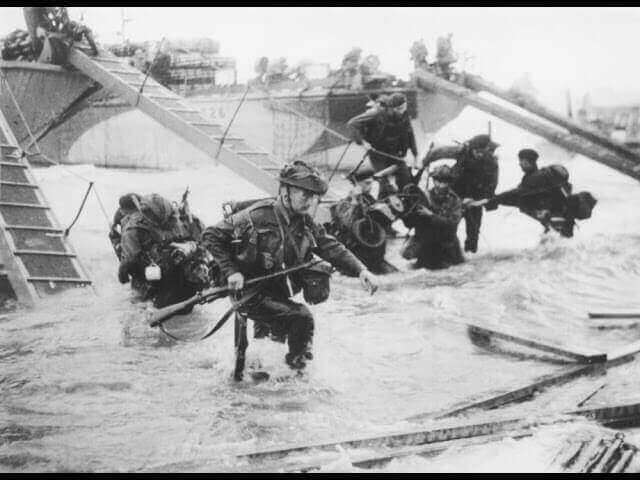 Canadian troops landing on Juno Beach. Sword Beach was the farthest eastern Allied landing site at Normandy. The British 3rd Infantry Division ran into a massive minefield and barricades, and were forced to clear the mines. Their armoured unit, consisting 21 DD tanks and other modified vehicles, was able to hold off the German resistance. A lead element of the 3rd Infantry Division entered Caen but was soon driven away by the Germans. The 21st Panzer Division launched a counterattack on Sword and Juno beaches but retreated as they were about to reach the coastline. The landing had been established. The British force landed 29,000 men at this beach and suffered approximately 1,000 casualties. As the first wave of paratroopers landed, the staff of Heeresgruppe B Headquarters understood the significance of this Allied move. The mass landing of an Allied force was definitive of an Allied invasion. The German Western Front headquarters and Heeresgruppe B negotiated with German High Command and requested the Panzer Lehr division south to Paris and 12 SS-Panzerdivision "Hitlerjugend" to move toward the coasts. The request was not immediately addressed due to communication issues. In the afternoon, Rommel returned to Heeresgruppe B Headquarters, reestablished command, and gave his first orders of the day to the German Army. At the coast, the 21st Panzer Division was the only German armoured unit near the coast. This division launched a counterattack that almost severed the connection between the British and Canadian forces but later withdrew to deal with the airdrop of the British 6th Airborne Division. The German counterattack on D-Day thus came to an end. The Allied landing forces encountered stiff resistance from the German Army. However, because the Luftwaffe had lost air superiority to the Allies over the past years, they were unable to stop the landings using air power. The German resistance was successfully held off thanks in part to Allied air power. Before sunset on D-Day, 5 American divisions established their positions on the shore: they consisted the 1st, 4th, 29th Infantry Divisions, 82nd and 101st Airborne Divisions, as well as equipment, tank, artillery and other support units. The British and Canadian forces to the east similarly established bases of operation. 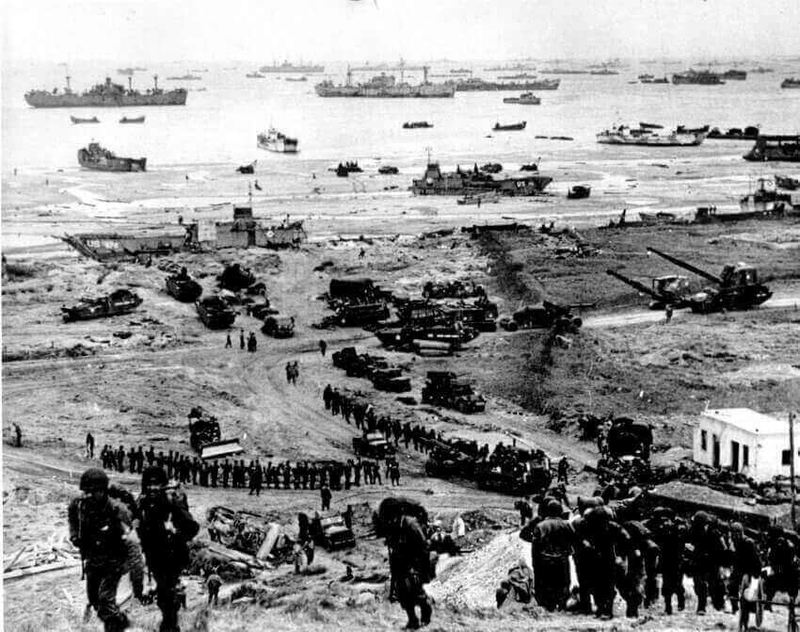 At this time, the Allied forces had overcome the Germans on the beach and established a beachhead that would allow reinforcements and supplies to be delivered for use in subsequent operations. 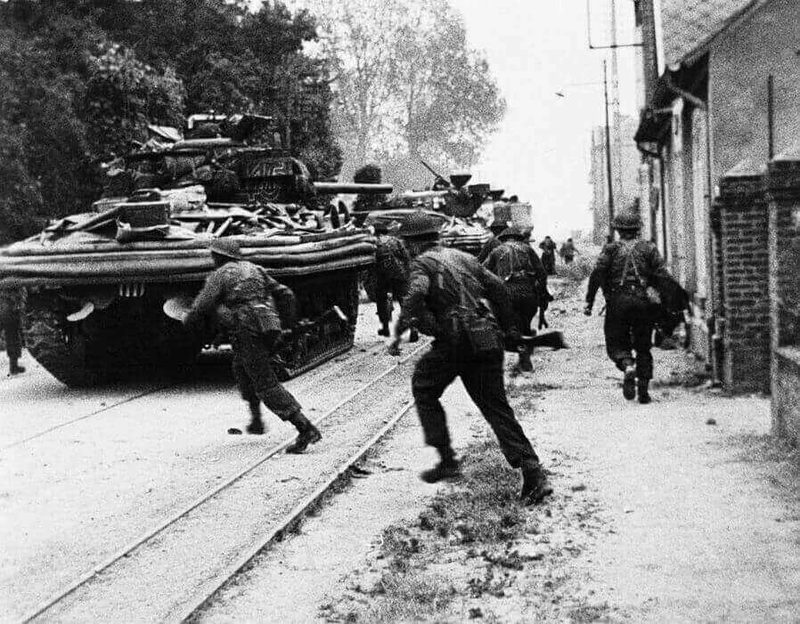 Now that the landings had come to an end, the Allies would advance further into Normandy to secure their foothold in France.